HUD understands that Point-in-Time (PIT) Counts are complex and utilize many resources at the local level. We have been working with our Federal and philanthropic partners to develop some additional resources for CoC use. HUD and the VA have been working together to ensure that coordination is happening at all levels – from the local level to the Federal level – to promote the goal of ending veterans homelessness by 2015. VA has generously offered CoCs across the country assistance by requiring that VA personnel from each VA Medical Center (VAMC) participate in the local PIT Count! CoC leads may be contacted by VAMC staff in the coming days. These experienced case managers, clinicians and outreach workers can bring needed skills and expertise to the volunteer effort the night of the count. PLEASE take advantage of this critical resource – and use this as an opportunity to get to know your local VA staff if you don’t already! HUD is also encouraging CoCs to share reliable data with VA staff after the PIT Count, so that VAMCs can keep up with the local data and engage more fully in the work CoCs are doing to end homelessness. The 2013 PIT count is listed as one of the service opportunities associated with the annual celebration of the Dr. Martin Luther King, Jr. (MLK) Day of Service, which is led by the Corporation for National and Community Service. As a part of this effort, HUD is encouraging volunteers to reach out to the CoC to learn how to get involved with the count. HUD also encourages you to post your volunteer opportunities at MLKDay.gov so that individuals in your community who seek to honor Dr. King through service will find your opportunities. PSA describes how volunteers can "Make Everyone Count"
HUD and Grammy Award-winning singer and songwriter Cyndi Lauper are joining the effort to “Make Everyone Count,” a national campaign to support local one-night counts of homeless persons and families. 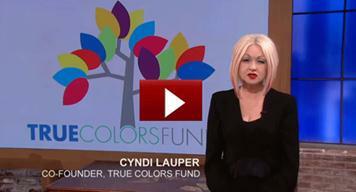 Cyndi Lauper and the True Colors Fund’s Forty to None Project produced a national public service announcement to encourage viewers to contribute their time to gather needed data on the scale of homelessness throughout the U.S. Still need volunteers for your count? CoCs can access Cyndi’s video on YouTube to use for volunteer outreach!